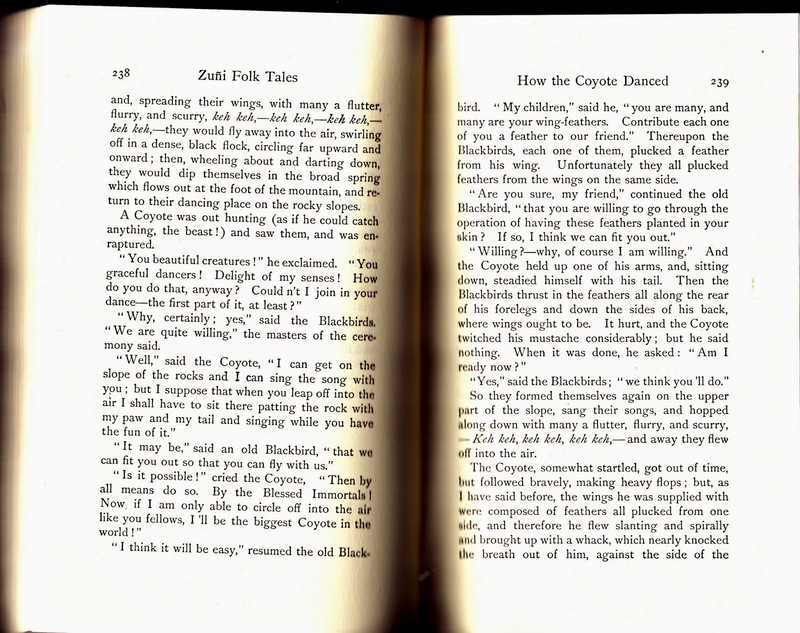 I love Coyote tales! 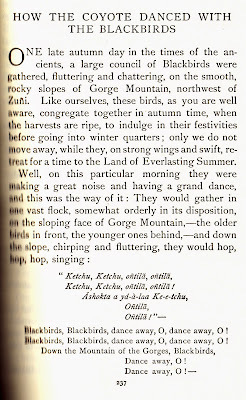 The trickster, however, in most Native American folklore traditions may only be told during winter months. (Whenever I have told "Coyote in the Land of the Dead" out of season I've gotten some whopping respiratory infections. Coincidence? Dunno, but I no longer do that.) 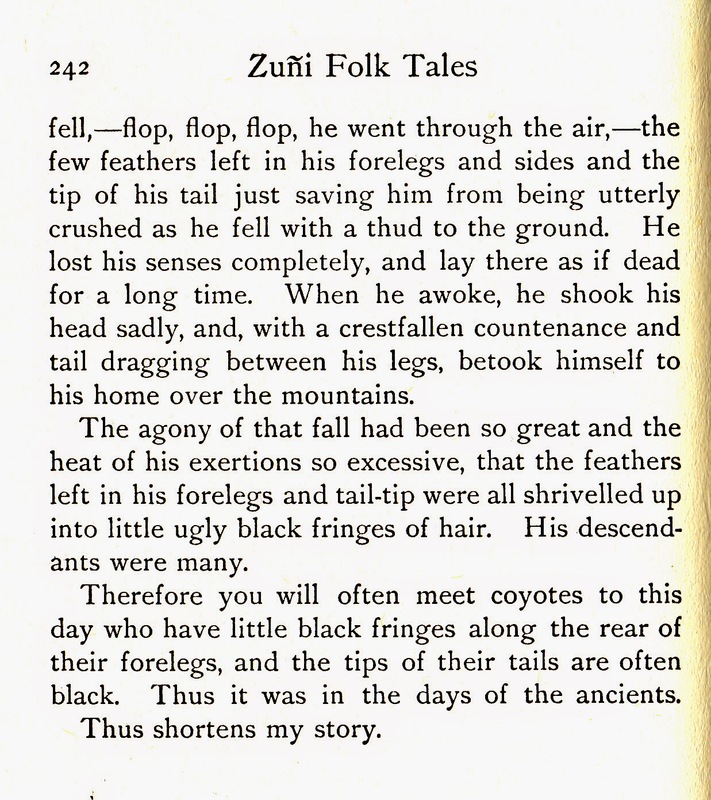 Doubt reading is a problem, but Frank Hamilton Cushing's coyote tales found in Zuñi folk tales is never listed as if it's "The Coyote" archetype...but it sure seems like him! 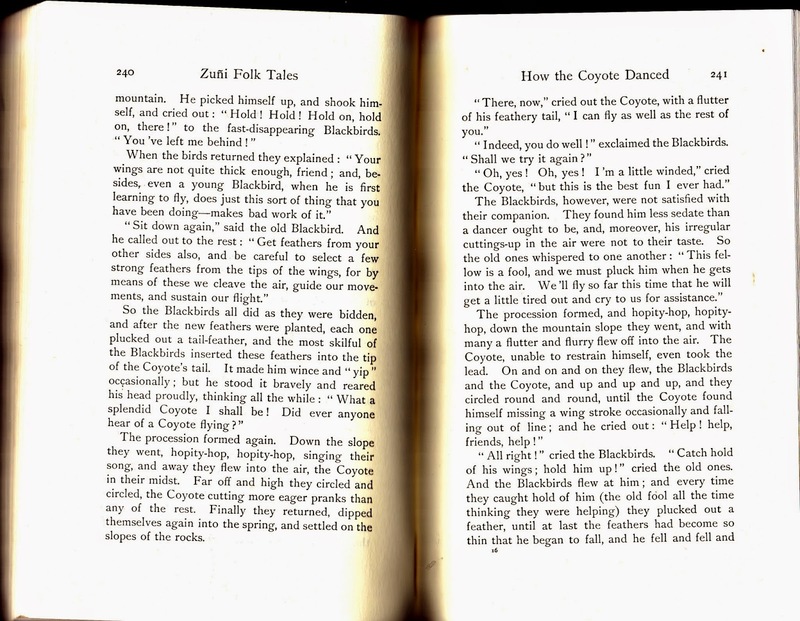 That ending of "Thus shortens my story" is the closing for all stories in the book. 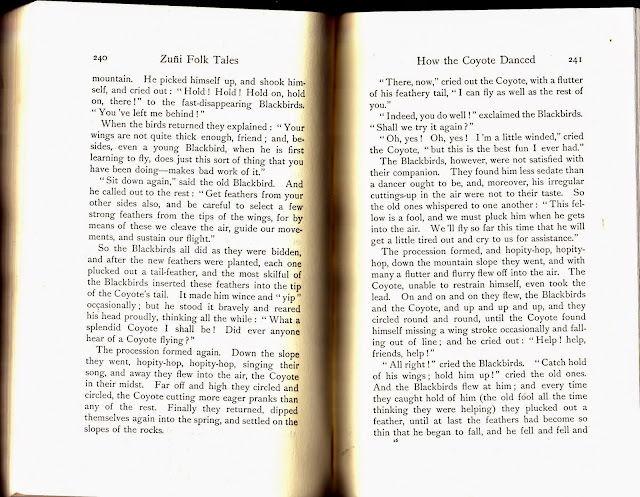 Another well-known story in the collection is "The Poor Turkey Girl", which the Introduction discusses briefly, saying it has Cinderella elements, but should NOT be considered just a taking of that story and making it their own. Rather it tells of the Pueblo experience. 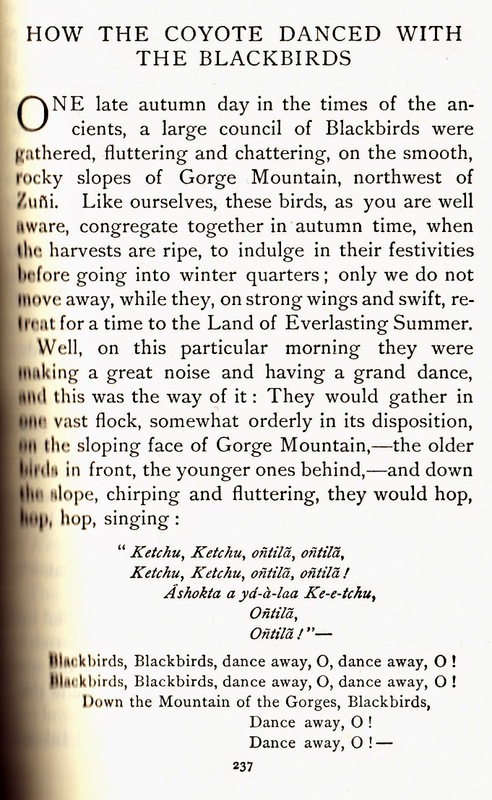 As for Cushing himself, his role as a pioneer ethnologist is also explored by PBS in text and a program. There's more that can be found about Cushing's work, but that is taking it on other trails. Today I prefer to stay with Coyote. 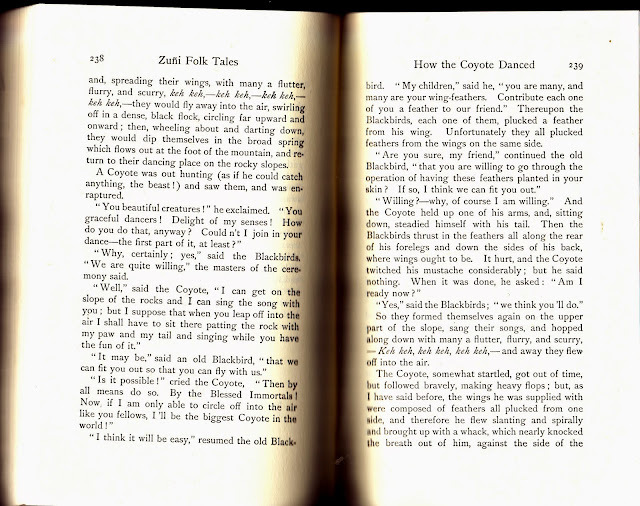 I have material I plan to add later that came my way after the Clara Bayliss story on Coyote. 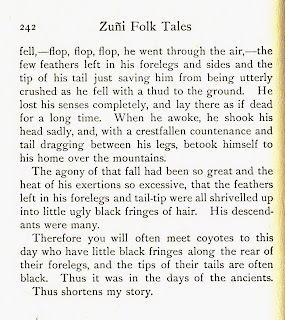 I may also do a bibliography on Coyote stories. All of this depends on retrieval of some backup of my computer. I can manage to get into computer trouble without blaming Coyote for my posting his adventures online.